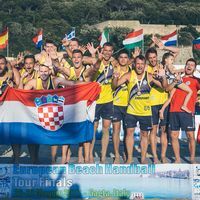 2016 marked a non-voluntary break for Croatian beach handball powerhouse Detono Zagreb. One year ago at the ebt Finals 2016 in Thessaloniki, to their own dismay, they had lost the semi-final and eventually only placed third. Hence in 2017 it was time to take revenge for the 2009 to 2012 and 2014 & '15 ebt Finals winners – and they did not mess with the opportunity. On Sunday in the men's final at the ebt Finals in Gaeta, Zagreb beat BHT Auto Forum Plock 2:0 to claim their seventh title. One hour earlier, Club Balonmano Playa Algeciras from Spain beat Hungarian side Multichem Szentendrei 2:1 (12:10 in the shoot-out) to claim women's gold. Westsite Amsterdam have won women's bronze, beating the OVB Girls from Hungary 2:1 in the match for third place. In the men's event, defending champions G.A.S. Kilkis Akropolis eventually had to be satisfied with bronze. They had lost the semi-final earlier on Sunday 2:0 against Detono Zagreb, but beat Salgótarjáni Strandépítok BHC from Hungary 2:1 in the bronze medal game. Furthermore, there was some individual honour a player from the Greek side. Ioannis Lazaridis was voted the tournament's MVP. Zagreb's David Heningman was voted best goalkeeper while Milosz Rupp from BHT Auto Forum Plock secured himself the top scorer trophy with 74 points. Dutch side TSHV Camelot received the fair play award. In the women's event, Renata Andrea Csiki from Multichem Szentendrei was voted MVP, her teammate Agnes Kokai became best goalkeeper. Algeciras' Maria Asuncion became top scorer with 69 points, and WBHC Kontesa Nera from Croatia received the fair play award.